Homemade Soap Recipe - "Contrary Mary Gardeners Scrub"
This wonderful homemade soap recipe creates a fantastic gardener's soap scrub that will make a great gift for your favourite green thumb. Scented with Sweet Orange, Palmarosa, Rosewood and Ylang Ylang essential oils, this lovely pale yellow bar has a delicious floral citrus scent. The addition of cornmeal provides a pretty pale yellow colour and nice gentle scrub. 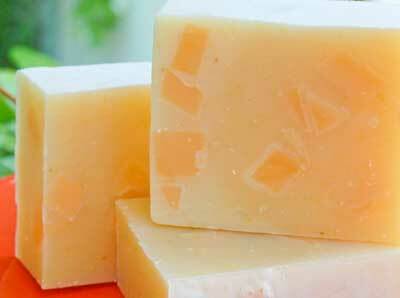 I've added chunks of orange coloured soap to the recipe for a bit of extra colour but you can omit them if you choose. Distilled Water - 324 gr. | 11.45 oz. Lye - 127.56 gr. | 4.5 oz. Follow the directions for your preferred soap making method found on the How to Make Soap page and incorporate the additional directions below. Bring the soap batter to a medium trace and add the cornmeal. Be sure to mix well. Add in the essential oils, mix and then drop in the soap chunks. Pour the soap batter into your prepared soap mould and insulate. Remove the soap from the mould once it is firm to the touch. About 24 to 48 hours if the soap went through the gel phase otherwise you might want to give it another day or two.